One of the unfortunate truths of being a full-time blogger is that I spend way more time on my electronic devices than I would care to admit. Anytime I'm home, at my co-working space, or at a coffee shop, my eyes are glued to my laptop; and when they're not, they're fixated on my phone. What can I say? I'm a millennial-- being addicted to devices is what we're most famous for. My job also revolves around the internet and digital world, so I couldn't really help if it I tried. All of this is to say that, unsurprisingly, my eyes get tired at the end of the day. This means that I'm prone to eye fatigue, device-induced headaches, and blurred vision. I also have a nasty habit of checking said devices before I go to bed, causing my eyes to feel wide awake even when my body is exhausted and trying to sleep. Has that happened to you too? 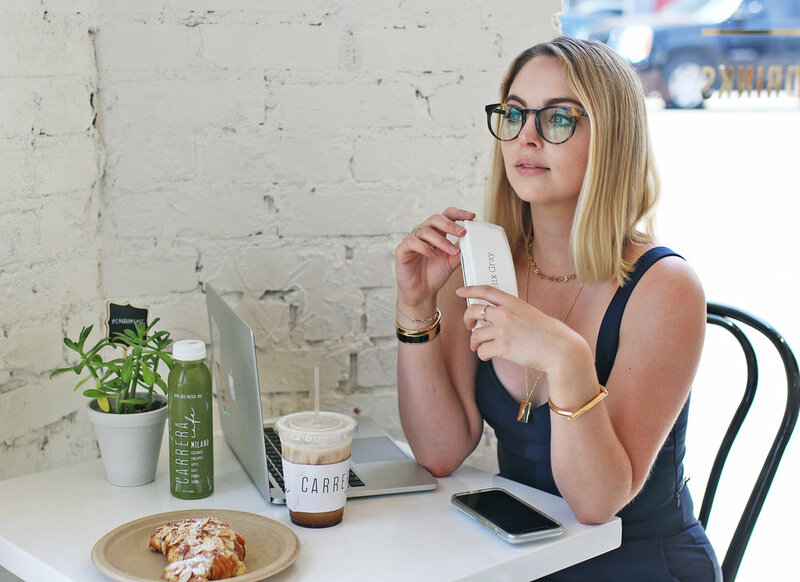 Such a modern problem calls for a modern solution, and yet one company came up with a solution that's actually pretty vintage with a technological twist: eyeglasses. Yes, this technology that has been around for countless centuries is being used against digital eye strain, all thanks to a company called Felix Gray. Their propriety lenses filter Blue Light and eliminate glare to reduce side effects of prolonged screen use. Felix Gray's Blue Light filtering technology is embedded within the lens, so the glasses are still effective, but thankfully don't have that unfortunate yellow tint or color distortion of other Blue Light filtering glasses. And I have to say, their glasses are actually both stylish and great quality. The designs are cool, fashionable, and universally flattering. I've actually been wearing these Felix Gray frames for a few months now (the Turing in Whiskey Tortoise). They come in a sleek, lightweight case with a cleaning cloth, which I carry with me everywhere. Whether I'm home in bed on a Friday night online shopping or working from a coffee shop, I pop them on, seeing a notable difference in how my eyes handle the many hours spent on my electronics. I've never needed prescription glasses for vision issues, so wearing eyeglasses on a regular basis has been a slight adjustment. But real talk; I have been kind of enjoying how smart these make me look. To those of you that do wear prescription glasses: fear not! They come in non-prescription, prescriptions, and reading glasses. Plus, they start at just $95, which is pretty reasonable considering the traditionally high cost of eyeglasses.